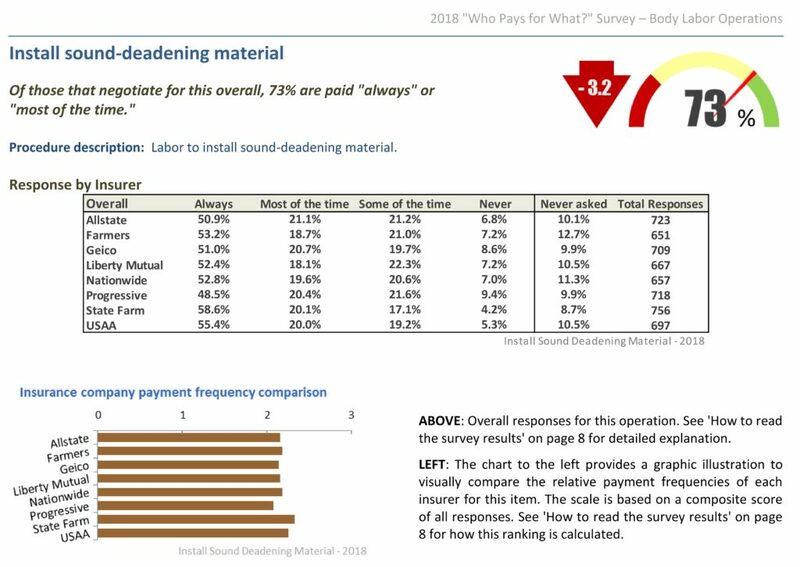 Data from the latest “Who Pays for What?” survey indicates collision repairers are having success asking insurers to pay them for replacing sound deadening material. Ironically, fewer repairers reported asking to be paid for removing it when damaged, and those who did reported less success invoicing insurers for the work. About 73 percent of the several hundred shops responding to the April body operations survey reported being paid “always” or “most of the time” whenever they asked the nation’s Top 8 insurers for reimbursement. The tally for what the survey called a not-included operation decreased by 3.2 percentage points from the prior year. 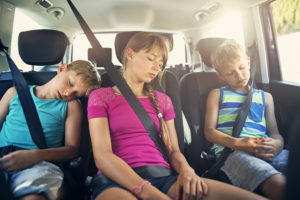 But the overall widespread acceptance of the work is a good sign — for according to study co-author Mike Anderson of Collision Advice, duplicating OEM sound deadening might grow more difficult. The overall margin of error for the survey is 3.5 percentage points, so the decrease might not be statistically significant. Only about a tenth of the shops reported they’d never asked to be reimbursed for the work. Database Enhancement Gateway inquiries from 2008, 2009 and 2012 identified in the report indicate the work is not included in all three estimating services. A 2008 inquiry for CCC about a 2007 Honda Civic quarter panel asked how the time for caulk/sealer should be considered. … 2. THE MITCHELL PUBLISHED LABOR TIME INCLUDES REGLUING THE DOOR INTRUSION BEAM AND SECONDARY CROSS BRACE WITH FOAM TYPE SEALER. 3. SOUND DEADENING MATERIAL IN THIS CASE IS CONSIDERED TO BE THE ADHESIVE PAD, OR SPRAYABLE MATERIAL, THAT ATTACHES TO THE INSIDE OF THE PANEL. SOUND DEADENING IS NOT AN INCLUDED OPERATION PER P-PAGE 16. In 2012, a user mentioned that “NONE OF THE SOUND PADS ARE IN IN THE DATABASE” for the trunk floor of a 2011 Mercedes GLK 350. “We have reviewed your inquiry and sound-deadening pads are not supported in the database, these would be a manual entry by the user,” Audatex replied. Audatex also recently updated its Database Reference Manual to declare “OEM aesthetic appearance matching of sealants, sound deadening or bonding materials” not-included labor procedures. Of the less than 60 percent who did ask, only 47 percent reported being paid “always” or “most of the time,” down 2.4 percentage point from the previous year. As is often the case with these studies, State Farm and USAA were most consistent about paying repairers who asked, while GEICO and Progressive were the worst about paying shops. 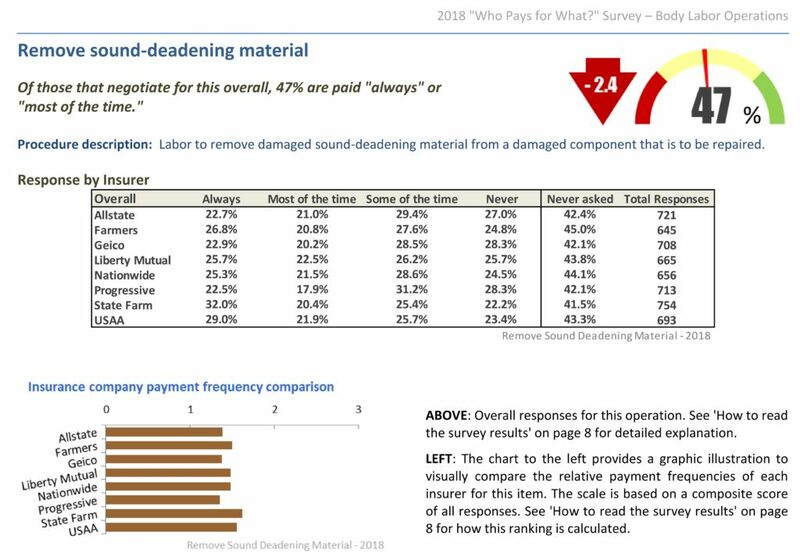 The DEG didn’t produce inquiries for Mitchell or Audatex related to removing old sound deadening material, which the “Who Pays?” survey called a not-included procedure as well. It did offer a 2008 CCC-related inquiry about how sectioning a 2007 Saturn Ion 2 floor pan. Help the industry by taking the current “Who Pays for What?” survey on frame and mechanical operations here through July 31. All answers are kept confidential — data is published only in the aggregate — and participants receive a copy of the report. Collision Advance and CRASH Network encourage a shop to designate the person “most familiar with the shop’s billing practices and the payment practices of the largest national insurers” to complete the poll, which they say takes about 15-30 minutes.